Despite some of the attractions Eyre Peninsula has - open spaces, beautiful coastlines, fresh seafood and good wine – it has so far remained under the radar of many Asian tourists, including those from Singapore. Though 434,000 Singaporeans visited Australia last year, only three per cent went to South Australia (according to Tourism Australia’s figures released during the Australian Tourism Exchange in Adelaide this April). Out of this figure, a smaller number ventured to Eyre Peninsula. For a start, “Eyre” is pronounced as “Aire”, not “error”. There are definitely more than five things you might not know about this gem. Owner of Australian Wildlife Adventures Craig “Hassie” Haslam brought us around and showed us the ways to enjoy Eyre. His repertoire is a lot wider – we’re just scratching the surface with these. 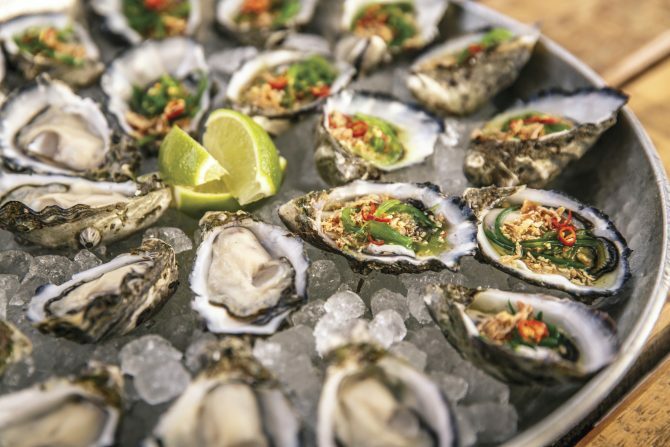 ‘Hassie’ took us out to Coffin Bay where oyster farms set out in the sea are aplenty – you can have oysters straight from sea to stomach. We went on a farm visit with Pure Coffin Bay Oyster. Chris Hank who runs the business with his wife will explain the farming process and growth cycles of the oyster and also teach you how to safely shuck these sweet little nuggets of ocean freshness with just the right touch of crisp. Yes, you’d be surprised you can actually eat 30 oysters in one sitting. But you may feel less guilty in the knowledge that oysters are 99 percent fat-free with less than 0.03 percent cholesterol and they are rich in vitamins, minerals, and Omega-3.